SOSA (SOlo SAlsa) is a Dance Fitness Class! Lots of people love to dance- so this is a great way to keep fit for them. SOSA includes Salsa, Latin, Ballroom and other international dance styles, but you don’t have to have a partner or the confidence to go it alone. SOSA is a class that includes authentic dance steps and body styling in a fusion of dance and fitness. The choreography has been made easy – great songs and soundtracks! SOSA is designed with beginners in mind- you learn the steps to a routine and then dance it – so everyone is up and dancing straight away but with some knowledge of the steps first. For the more experienced dancers, there’s the option of advanced steps and body styling. SOSA is open to everyone – all shapes, sizes and abilities – and all ages. It’s about having fun and getting fit without realising it. The routines are high-energy but low-impact and we make sure no one is left struggling at the back. SOSA Dance is at Penistone Leisure Centre on Mondays at 10.30-11.15am and on Thursdays at 6-6.45 pm. Classes cost £4 pay as you go, and there are loyalty cards for people who want to pay for 6 classes in advance. A new activity for us this Easter Holidays! 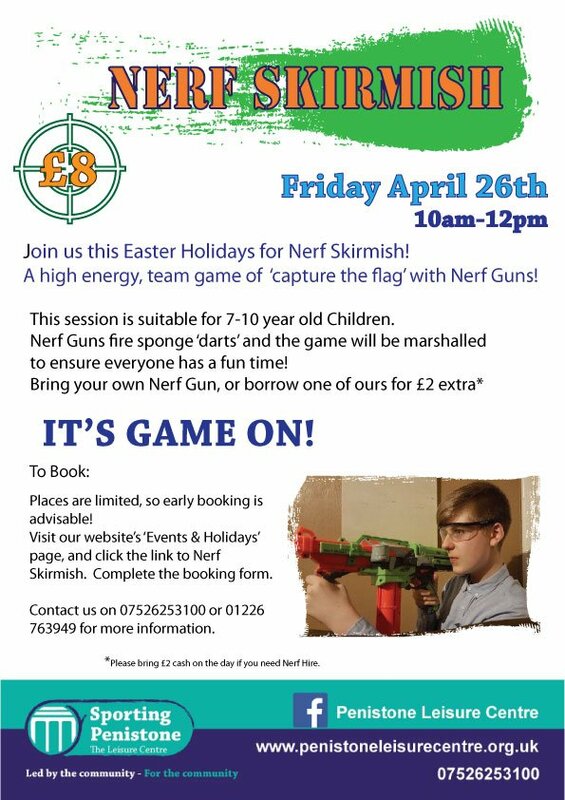 Join us for Nerf Skirmish on Friday 26th April from 10am-12pm. Places are limited and booking fast, so early booking is advisable! Please follow this link to book your spot(s) now! Before we had to urgently begin fundraising for the roof, we had begun the process of registering with a charity donations website called ‘Wonderful’. This took nearly a month to get set up, whilst they did their due diligence on us. At the time we didn’t have a month to wait when we needed funds for the roof so urgently! So that’s why we used a crowdfunding page via JustGiving. Our JustGiving page will close on 18.04.19. We’d love to accept donations from now, via Wonderful instead, because we will be able to claim gift aid on those donations too, so that should hopefully boost the funds even more! There is a button on the right hand column of nearly every page of our website which says ‘Donate to our Big Build Fund’, if you click it, it will take you to our ‘Wonderful’ page! Art Explosion in the School Holidays! We’re delighted to say that the Art Explosion team are joining us again, on Tuesday 23rd April from 9:30-1:30pm. Join instructors Jude and Ruth to get creative and make a designer bag! This session is suitable for Children aged 6-11. Bring a packed lunch as this session runs across lunchtime, but the tuck shop will be open for snacks too! To book your spot(s), please contact Jude on 07941 423894- Pay on the day and bring a signed consent form. Early booking is advisable, as there are limited spaces and this is always a popular session! Jude and Ruth are DBS checked, so you can leave your child(ren) for the morning, in their safe hands. Quidditch Fun in the Holidays! Looking for fun and different activities for kids in the school holidays? We have TWO muggle Quidditch matches lined up for Barnsley and Kirklees School Holidays! Join us on Thursday 18th or 25th April from 10:30am-11:15am for a fast paced and fun, team game! It’s just £4 per child. The object of the game of Quidditch is to score more points than your opponents. Players do this by scoring goals which is done by placing a slightly deflated volleyball called the Quaffle into the opposition’s goals giving them 10 points, and by capturing the Golden Snitch which is worth 30 points. Spaces are limited, and booking is required- please follow this link to the Quidditch page and reserve your spot there!